Nice little beauty offer for the weekend, and it’s exclusive to A Model Recommends readers. 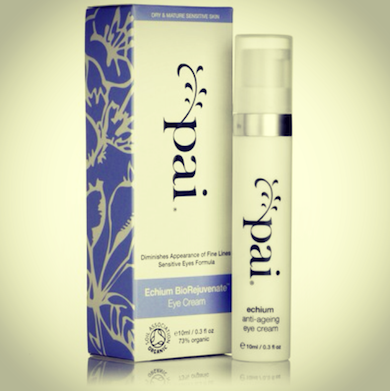 Pai are giving away a free Echium Anti-Ageing eye cream with every purchase over £20/€20/$30. It’s a full-size cream that usually costs £24, so a very good deal indeed! Pai’s Echium cream is still my most-used eye treatment for when my skin is sensitised or a little raw. I always take it on holiday because it’s so soothing after sun-exposure, and I make sure it’s in my bag when I go on shoots as it really helps to protect my eye area when makeup is being constantly reapplied. This is hailed as an anti-ageing cream (and it does contain a very potent form of Omega 3) but I think that it’s a true one-size-fits-all product. It’s gentle enough to use on any skin type and even younger skin can benefit from the rejuvenating properties. It’s free from alcohol, irritating chemicals, fragrance and sulfates and all of the ingredients, down to the tiniest, are listed clearly on the information page. If you want to see my original review, click HERE. My “Pai Best Buys” to go for, if you’re looking for recommendations, would be the Camellia & Rose Gentle Hydrating Cleanser and the Bioregenerate Rosehip Oil, which is bang on target at £20! It’s a great oil for helping to shift scars and marks on the skin and for improving general tone and firmness. The code for your free eye cream is PAIEYE. You won’t see the eye cream in your basket, but you’ll see a discount of one penny/cent. Once you’ve seen the discount, you’ll know the code has worked. It’s valid from now until 23.59 on Sunday 7th October 2012. Previous Post The Best Press Pack Ever.